Savvy Spending: Top Cash Back: new Xmas Treats Game! Play daily for a chance to win cash prizes! 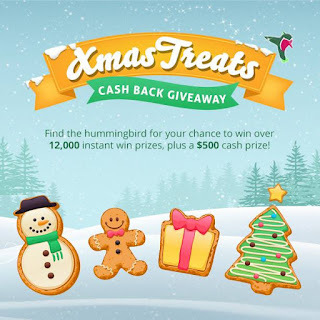 Top Cash Back: new Xmas Treats Game! Play daily for a chance to win cash prizes! REMINDER: have you been playing? Below is a list of the retailers where you can find treats! Top Cash Back is celebrating the season with a new cash giveaway! 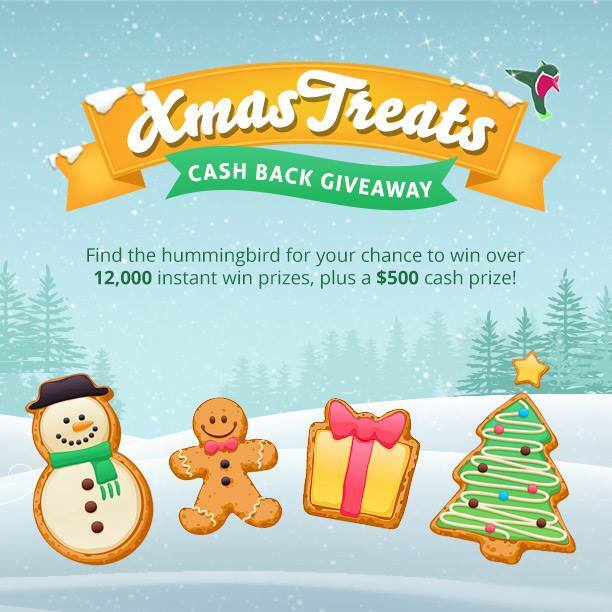 You can play the Xmas Treats Game for a chance to win over 12,000 instant win prizes, plus a $500 cash prize. You can play daily from 11/28 until 12/21. Each day, there will be a clue posted on their Facebook page. Figure out the clue and visit that merchant's page on Top Cash Back. Then click on the hummingbird with the present and reveal your prize! There will also be hummingbirds hidden around their site, so the more you click around, the better your chances of winning extra prizes! Go here for the terms and conditions! Each clue will be valid for the entire game, so you don't have to visit each store on the actual day of the clue. I'll keep a list of the merchants here as well!